December 13, 2013  The House passes the House-Senate budget compromise after Speaker John Boehner criticizes conservative groups — and implicitly their allies in Congress — for their opposition. Next stop: the Senate. December 11, 2013  The Obama administration just released the latest sign-up numbers for its troubled health insurance exchange website. Enrollment picked up last month, after a disastrous start in October. Still, the number of people signing up for coverage is below the administration's original forecasts. December 11, 2013  The current South African leader was expecting to bask in the reflected glory of Nelson Mandela. 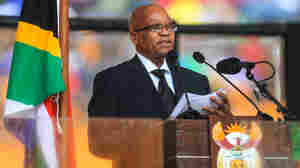 But when Zuma appeared at the beloved Mandela's memorial service, he was booed at every turn. It represented the democracy Mandela championed — and the public's deep discontent with scandal-ridden Zuma. December 11, 2013  Renee Montagne talks with Ofeibea Quist-Arcton about South Africa's 10-day goodbye to Nelson Mandela. His body will lie in state at the Union Buildings in Pretoria, the scene of his presidential inauguration in 1994. December 10, 2013  Coverage of the memorial service for Nelson Mandela in Johannesburg includes part of President Obama's speech. December 10, 2013  Tens of thousands crowded into South Africa's national soccer stadium in Johannesburg in the pouring rain to pay tribute to Nelson Mandela, who helped transform the nation. The deputy president of the African National Congress party, Cyril Ramaphosa, made the opening remarks, referring to Mandela by his clan name. December 4, 2013  It's more than likely that overhauling immigration will not happen this year. Congress has only nine working days left in 2013. And it appears, the issue will not be resolved next year either. December 3, 2013  Companies often practice image management. That is, after being caught doing something bad, they invest in philanthropic projects. Research is asking whether companies that do good are ever motivated to "cash in" on their good credit? November 21, 2013  Afghan President Hamid Karzai has convened an assembly of tribal and religious leaders to debate a proposed security pact with the United States. The accord would allow some U.S. forces to remain in the country following the completion of NATO'S withdrawal at the end of 2014. November 20, 2013  Negotiators from Iran and six world powers are back in Geneva for another round of talks on Tehran's nuclear program. There are signals that a preliminary deal over the future of Iran's nuclear program may finally be within in reach. November 19, 2013  The director of the National Intelligence has released another set of previously secret documents about NSA surveillance programs. The released followed a freedom of information request by the ACLU and the Electronic Frontier Foundation. The documents, many heavily redacted, reveal more about NSA programs. November 19, 2013  The Justice Department is said to be announcing on Tuesday a $13 billion settlement with JPMorgan Chase. The deal centers on mortgage securities issued in the run-up to the financial crisis. November 18, 2013  Reruns used to mean watching the same network episodes over again, say during the summer. Years later, viewers could catch a favorite show on cable. These days, reruns are tucked in just before prime-time lineups. And now binge viewers can catch them online with services such as Amazon, Hulu and Netflix.